Thymidine phosphorylase is an enzyme that in humans is encoded by the TYMP gene. Platelet-derived endothelial cell growth factor (ECGF1) is an angiogenic factor which promotes angiogenesis in vivo and stimulates the in vitro growth of a variety of endothelial cells. ECGF1 has a highly restricted target cell specificity acting only on endothelial cells. Because it limits glial cell proliferation, ECGF1 is also known as thymidine phosphorylase and as gliostatin. The ECGF1 gene contains 10 exons spanning more than 4.3 kb. Thymidine phosphorylase activity of ECGF1 in leukocytes from mitochondrial neurogastrointestinal encephalomyopathy (MNGIE) patients was less than 5 percent of controls, indicating that loss-of-function mutations in thymidine phosphorylase cause MNGIE. ^ Usuki K, Saras J, Waltenberger J, Miyazono K, Pierce G, Thomason A, Heldin CH (Jun 1992). "Platelet-derived endothelial cell growth factor has thymidine phosphorylase activity". Biochem Biophys Res Commun. 184 (3): 1311–6. doi:10.1016/S0006-291X(05)80025-7. PMID 1590793. ^ Spinazzola A, Marti R, Nishino I, Andreu AL, Naini A, Tadesse S, Pela I, Zammarchi E, Donati MA, Oliver JA, Hirano M (Feb 2002). 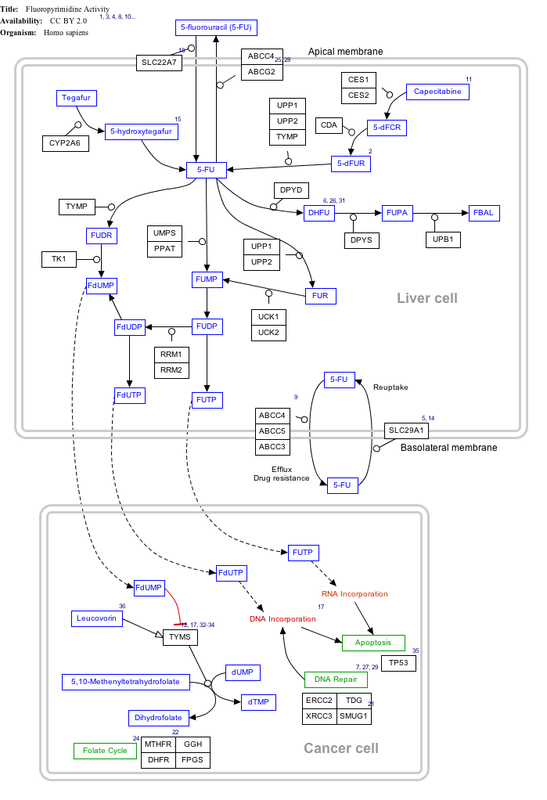 "Altered thymidine metabolism due to defects of thymidine phosphorylase". J Biol Chem. 277 (6): 4128–33. doi:10.1074/jbc.M111028200. PMID 11733540. ^ "Entrez Gene: ECGF1 endothelial cell growth factor 1 (platelet-derived)". Yang Q, Yoshimura G, Mori I, et al. (2002). "Thymidine phosphorylase and breast carcinoma". Anticancer Res. 22 (4): 2355–60. PMID 12174926. Asai K, Nakanishi K, Isobe I, et al. (1992). "Neurotrophic action of gliostatin on cortical neurons. Identity of gliostatin and platelet-derived endothelial cell growth factor". J. Biol. Chem. 267 (28): 20311–6. PMID 1400349. Furukawa T, Yoshimura A, Sumizawa T, et al. (1992). "Angiogenic factor". Nature. 356 (6371): 668. doi:10.1038/356668a0. PMID 1570012. Stenman G, Sahlin P, Dumanski JP, et al. (1992). "Regional localization of the human platelet-derived endothelial cell growth factor (ECGF1) gene to chromosome 22q13". Cytogenet. Cell Genet. 59 (1): 22–3. doi:10.1159/000133191. PMID 1733667. Hagiwara K, Stenman G, Honda H, et al. (1991). "Organization and chromosomal localization of the human platelet-derived endothelial cell growth factor gene". Mol. Cell. Biol. 11 (4): 2125–32. doi:10.1128/MCB.11.4.2125. PMC 359900. PMID 2005900. Ishikawa F, Miyazono K, Hellman U, et al. (1989). "Identification of angiogenic activity and the cloning and expression of platelet-derived endothelial cell growth factor". Nature. 338 (6216): 557–62. doi:10.1038/338557a0. PMID 2467210. Bardosi A, Creutzfeldt W, DiMauro S, et al. (1987). "Myo-, neuro-, gastrointestinal encephalopathy (MNGIE syndrome) due to partial deficiency of cytochrome-c-oxidase. A new mitochondrial multisystem disorder". Acta Neuropathol. 74 (3): 248–58. doi:10.1007/BF00688189. PMID 2823522. Miyazono K, Okabe T, Urabe A, et al. (1987). "Purification and properties of an endothelial cell growth factor from human platelets". J. Biol. Chem. 262 (9): 4098–103. PMID 3549724. Usuki K, Gonez LJ, Wernstedt C, et al. (1994). "Structural properties of 3.0 kb and 3.2 kb transcripts encoding platelet-derived endothelial cell growth factor/thymidine phosphorylase in A431 cells". Biochim. Biophys. Acta. 1222 (3): 411–4. doi:10.1016/0167-4889(94)90049-3. PMID 8038210. Hirano M, Silvestri G, Blake DM, et al. (1994). "Mitochondrial neurogastrointestinal encephalomyopathy (MNGIE): clinical, biochemical, and genetic features of an autosomal recessive mitochondrial disorder". Neurology. 44 (4): 721–7. doi:10.1212/wnl.44.4.721. PMID 8164833. Stevenson DP, Milligan SR, Collins WP (1998). "Effects of platelet-derived endothelial cell growth factor/thymidine phosphorylase, substrate, and products in a three-dimensional model of angiogenesis". Am. J. Pathol. 152 (6): 1641–6. PMC 1858429. PMID 9626068. Nishino I, Spinazzola A, Hirano M (1999). "Thymidine phosphorylase gene mutations in MNGIE, a human mitochondrial disorder". Science. 283 (5402): 689–92. doi:10.1126/science.283.5402.689. PMID 9924029. Asgari MM, Haggerty JG, McNiff JM, et al. (1999). "Expression and localization of thymidine phosphorylase/platelet-derived endothelial cell growth factor in skin and cutaneous tumors". J. Cutan. Pathol. 26 (6): 287–94. doi:10.1111/j.1600-0560.1999.tb01846.x. PMID 10472757. Sivridis E, Giatromanolaki A, Koukourakis MI, et al. (2000). "Thymidine phosphorylase expression in normal and hyperplastic endometrium". J. Clin. Pathol. 53 (9): 704–8. doi:10.1136/jcp.53.9.704. PMC 1731246. PMID 11041061. Komatsu T, Yamazaki H, Shimada N, et al. (2001). "Involvement of microsomal cytochrome P450 and cytosolic thymidine phosphorylase in 5-fluorouracil formation from tegafur in human liver". Clin. Cancer Res. 7 (3): 675–81. PMID 11297264. Kojima H, Shijubo N, Abe S (2002). "Thymidine phosphorylase and vascular endothelial growth factor in patients with Stage I lung adenocarcinoma". Cancer. 94 (4): 1083–93. doi:10.1002/cncr.10352. PMID 11920479. This article on a gene on human chromosome 22 is a stub. You can help Wikipedia by expanding it. This page was last edited on 22 March 2019, at 03:13 (UTC).